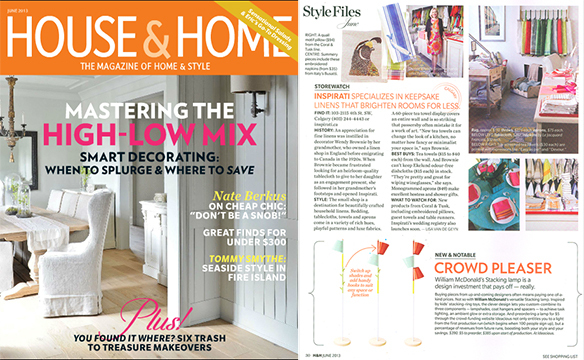 It’s always great to see one of our contributors showcased in a print publication — in this case, local talent William McDonald’s Stacking Lamp, featured in Canadian House & Home magazine (published by Lynda Reeves and edited by Suzanne Dimma, two of Canada’s most prominent style experts). The article, written by Kristen Koch, can be found under the ‘Style Files’ section of the nation’s top design and decorating mag on page 30. “Buying pieces from up-and-coming designers means paying one-of-a-kind prices. 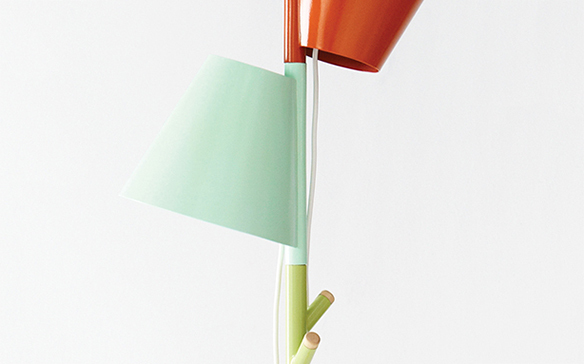 Not so with William McDonald’s versatile Stacking Lamp. …the clever design lets you custom-combine its three components — lamp shades, coat hangers, and spacers — to achieve task lighting, an ambient glow, or extra storage.” The components are steel constructed and available in a variety of colours. The Stacking Lamp was initially submitted to ideacious after Will won our sponsored award at the 2012 ACIDO Rocket Show. The lamp was then featured at the Interior Design Show (IDS) where it caught the eye of House & Home’s Senior Features Editor, Kimberley Brown. Will’s work ranges from furniture and lighting, to wheelchairs and architectural systems. Using his strong background in mechanical and conceptual thinking he combines “minimal forms and contrasting materials together to create useful, honest, and modern products”. Articles like this are a promising sign for the future of design. They help build exposure for a small, budding community of independent designers working with crowdfunding platforms like ideacious to create beautiful new products — and we can’t wait to see more like it! Pre-order the Stacking Lamp and you’ll not only get the lamp but also a share of future sales. Get more details or preorder here. This entry was posted in Blog, Magazine, Print Publication and tagged Arts, colourful, Design, home, house, innovation, interior, Interior design, lamp, Light fixture, lighting, lights by igopaolo. Bookmark the permalink.